Quality circles consist of a basically formal, institutionalized mechanism for productive and participative problem solving interaction among the employees of an organization. Quality circles are made of groups of employees (normally 6 to 12) who perform similar tasks or share an area of responsibility. The groups meet on a regular basis, usually under the leadership of a supervisor and often with management, to discuss work related issues and to offer suggestions and ideas which when implemented not only improve the performance of the organization but also motivate and enrich the work of the employees. Quality circles operate on the principle that employee’s participation in decision making and problem solving improves the production methods and the quality. The characteristics of quality circles are that they consist of volunteers who set their own rules and priorities, take decisions by consensus and use organized approaches to problem solving. Quality circles activities should not be in the direction of fault finding. When matured quality circles become self managing, and gain the confidence of management. Quality circles enable the enrichment of the lives of the employees and create harmony and high performance. Typical work related issues are improvements in occupational health and safety, product design, manufacturing processes and improvement in the workplace. Quality circles dates back to 1950s when they were first seen in the United States. But they were seriously developed and implemented by Dr Kaoru Ishikawa in Japan in 1960. The first quality circle was registered in 1962. Quality circles were re-exported to USA in the early 1970s. International Association of Quality Circles was formed in USA in 1977. BHEL Hyderabad was the first organization in India to start quality circles in 1982. • To contribute actively towards the improvement and development of the organization. • To exist within the prevailing organizational structure to overcome the barriers so as to foster an open exchange of ideas. • To help employees to respect humanity and to build a happy work place worthwhile to work. • To display human capabilities completely and to draw out the numerous possibilities in a long run. • To improve the quality of products and services. • To improve various competencies. This is also one of the goals in all organizations. • To reduce the cost and the wasteful efforts in the long run. • To improve efficiencies which in turn reduce the lead time resulting in an improvement in meeting customers due dates. • Customer satisfaction is the fundamental goal for any organization. Quality circles help in achieving this goal and help the organization to be competitive for a long time. The structure of a quality circle is shown in Fig. 1. 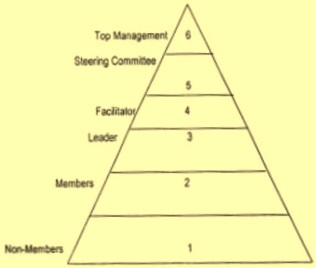 The basic elements in the formation of a quality circle are (i) top management (ii) steering committee (iii) coordinator or facilitator (iv) leader (v) members and (vi) non member. Top management plays an important role in ensuring the success of implementation of quality circles in the organization. Steering committees consisting of middle management are also to play a positive role in quality circle activities for its success. Coordinator who also acts as a facilitator is an individual in the organization who has responsibilities for coordinating and directing the quality circle activities within the organization and carries out such functions as would make the operations of quality circles smooth, effective and self sustainable. He is nominated by the management and also acts as a catalyst, innovator, promoter and a guide. Leader of the quality circle is chosen by the members among themselves. Since the members of the quality circles are the basic element in the structure of the quality circle, they may decide to have a leader by rotation. Members of the quality circles are the small group of employees from the same work area or doing similar type of work. Non members are those who are not members of the quality circle but may be involved in the quality circle recommendations. Members of a quality circle normally use the following basic problem solving techniques to identify, analyze and find solutions to the problem. The members are to be properly trained in these techniques. • Analysis of the data using statistical tools like graphs, scatter diagrams, pareto diagrams, cause and effect or fishbone diagram, histograms and cumulative line diagram. • Use of problem solving techniques such as matrix diagrams, control charts, the 3 Mu approach, the 5 Ws and 1 H concept, 4 M and 1 E approach and many other techniques. There are no monetary rewards in the quality circles. But there are many other following advantages which largely benefit the individual and consecutively benefit the organization. • Quality circles assist in the self development of members by improving self confidence, attitudinal change and a sense of accomplishment. • Quality circles are consultative and participative activities where every member cooperates with others. This interaction assists in developing harmony and team spirit. • Quality circle members have a chance for attaining new knowledge by sharing opinions, thoughts and experience. • Every member gets a chance to build up his leadership potential because of the fact that any member can become a leader. • The mutual problem solving and presentation before the management assists the members to develop their communication skills. • Quality circles promote creativity by tapping the undeveloped intellectual skills of the individual. Individuals in addition execute activities diverse from regular work. This enhances their self confidence and gives them big job satisfaction. • Quality circles create a tension free atmosphere which is liked and understood by each individual member. Under such atmosphere each member cooperates with others.